The Ecosan waterless system together with the A.V light steel enclosure presents a good solution for the VIP toilets constructed largely in either rural areas or in areas where the municipal sewer infrastructure is not in place. 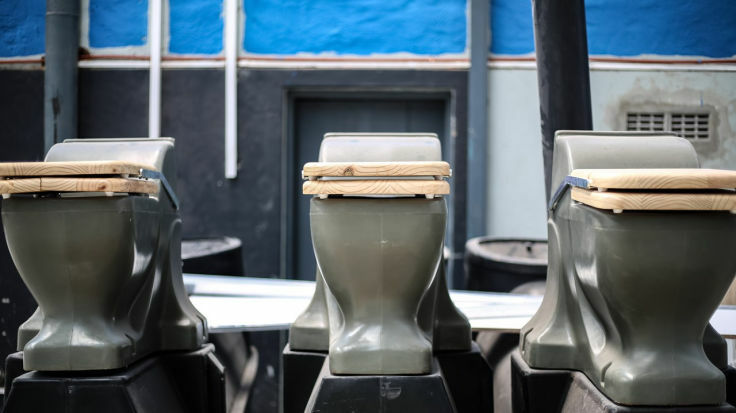 Ecosan Dry Toilets are a waterless toilet system that provides a safe, non-polluting and cost effective solution to the worldwide sanitation problem. Not only does it save on water use, but it is entirely isolated from the surrounding environment and cannot contaminate underground water resources. The system utilises a natural biological process to break down human waste into a dehydrated odourless compost-like material. The following is a brief description of the ECOSAN toilet concept as well as its main features. The human excrement falls down a vertical chute (2) and into one end of a specially designed helical screw conveyor (3). Every time the toilet lid (1) is lifted, a mechanism rotates the conveyor. With each rotation the human excrement slowly moves along, taking approximately twenty five days before falling into a reusable collection bag (4). It takes six months for the bag to fill with dry and odourless waste. Through the uniquely designed ventilation pipe (5), adequate airflow is provided for the dehydration / evaporation, deodorizing process. Human excrement consists of roughly 95% moisture. As the solids dry in the conveyer the urine and moisture is vented into the atmosphere. The solid waste then dries into a compost-like material, roughly 5 – 10% of it’s original mass. The dry waste is manageable and can be processed in the following ways. Each toilet comes standard with a urinal which is wall mountable either in a existing home or inside a toilet hut.